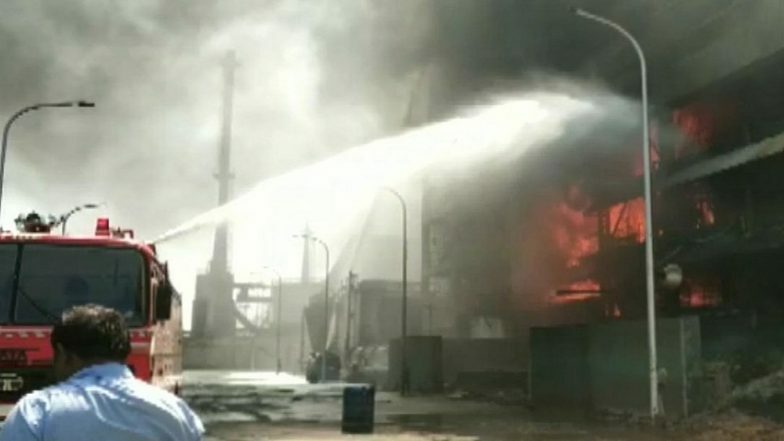 Raigad, February 24: A major fire broke out at an oil factory in Maharashtra’s Raigad district on Sunday. A total of 12 tenders rushed to the spot. Till now no injuries have been reported yet. However, the exact of the fire has still not been ascertained. More details are still awaited. Mumbai: Fire Breaks Out in Local Train at Juinagar Station; Services Disrupted on Trans-Harbour Line. Earlier this week, a massive fire incident was reported from Ghatkopar-Mankhurd Link Road in Mumbai. A crane caught fire and was seen engulfed in flames. No one was injured in the fire. The link road, where the incident took place, is an important road connecting the eastern suburbs to Navi Mumbai. The construction work of Ghatkopar-Mankhurd flyover is currently underway. In a similar incident last month, a fire broke out at a plastic factory in Kandivali. The cause of the fire was believed to be a short-circuit. Meanwhile, Last year, on December 24, at least four men were killed in a fire that gutted a cloth godown in suburban Kandivli area.